ST. ANDREWS, Scotland — The results of the last two major golf championships — a resounding seven-stroke victory by Louis Oosthuizen of South Africa at the British Open on Sunday and the United States Open win by Graeme McDowell of Northern Ireland a month earlier at Pebble Beach — have had an effect well beyond the borders of their countries. Graeme McDowell of Northern Ireland won the U.S. Open this year, his first tour win. They have reverberated in the United States. Last November, based on where the majors were scheduled to be played, 2010 had been expected to provide Tiger Woods with his best chance in a while to win two more major titles. Now with 14, Woods continues his quest to break Jack Nicklaus’s record of 18. Instead, two somewhat obscure non-American golfers followed Phil Mickelson’s win at the Masters by taking down the best in the world on two of the biggest stages. The unexpected results have put a spotlight on a trend in major championship golf that started in 2007 with Ángel Cabrera’s first United States Open win and Padraig Harrington’s first British Open victory. Since then, international players have won 9 of the 13 major championships, including three of the past four, dating to Y. E. Yang’s win over Woods in the 2009 P.G.A. Championship. To grasp the significance of this international run, consider the dominance of American golfers since all four Grand Slam events resumed play in 1946 after a three-year interruption. From then until 1990, when Nick Faldo of England won the Masters and the British Open, and Wayne Grady of Australia won the P.G.A. Championship, Americans won 132 of the 180 major championships — 73 percent. A five-year slump began in 1990, when golfers from the United States won just 7 of the 20 majors, including an unprecedented international sweep of the Grand Slam events in 1994. From then until 2007, international players had an average of one major victory a year. Whether this latest resurgence by international golfers can endure until the 2016 Olympics is an open question, but it certainly comes at a good time for those who are working to build international interest in the sport in the prelude to golf’s return to the Games. A look at the world rankings shows 7 American players in the top 20, 8 in the top 25 and 11 of the top 30. But top-ranked Woods is 34, No. 2-ranked Phil Mickelson is 40, No. 4-ranked Steve Stricker is 43 and No. 5-ranked Jim Furyk is 40. Of the 11 American golfers in the top 30, just three are in their 20s: Anthony Kim is 25, Dustin Johnson is 26 and Hunter Mahan is 28. The two most promising young players in the world are international stars: Rory McIlroy, 21, of Northern Ireland, and Ryo Ishikawa, an 18-year-old Japanese marvel. Ishikawa, who tied for 23rd at the British Open, shot a round of 58 earlier this year to win on the Japan Tour, the same day McIlroy — who opened at St. Andrews with a record-tying 63 — shot 62 to win at Quail Hollow. 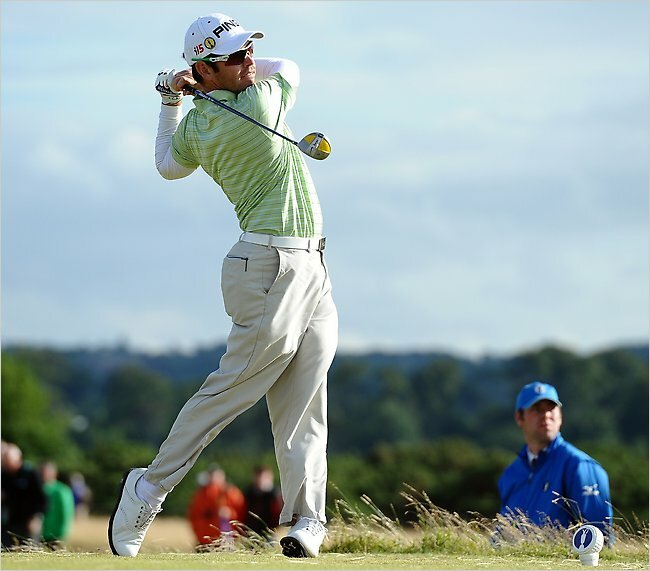 That brings us back to the 27-year-old Oosthuizen, who outshone McIlroy and Ishikawa at St. Andrews. He apparently has come of age after knocking around on the Sunshine Tour in South Africa and the European Tour. The question is, how could a little-known golfer with a lone win on the European Tour deliver such a thorough thrashing to a British Open field that was among the year’s best? Peter Dawson, the chief executive of the Royal & Ancient Golf Club of St. Andrews, said he thought the victory by Oosthuizen was well earned. Nor would most who saw him. But how they perform from now on will determine whether McDowell and Oosthuizen are one-off’s or part of a deep and talented wave of international players.